Respectful cleaning for any church, mousque, synagogue, temple, or other place of worship. Your Place of Worship is not only a gathering place for your members but a critical space in your community where families gather. We understand the importance of keeping this space looking clean and maintaining a clean and healthy environment for your members. 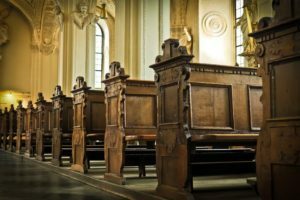 We also understand that Places of Worship differ greatly in both their building layout and their cleaning needs, which is why DBS will customize a service schedule to fit your individual needs. Rather than provide you with a cookie-cutter janitorial schedule, a DBS Representative will analyze your facility and understand your unique cleaning needs, and develop a service proposal to accomplish those unique needs. As always, our promise to deliver high-quality service is supported by the fact that we do not lock our customers into a long-term contract. Instead, we offer a month-to-month agreement to provide each client with the assurance that our service professionals will provide reliable and consistent cleaning services every time we visit your facility. Call DBS today or fill out the form above to have a dedicated representative contact you to provide a proposal for the cleaning of your church, mousque, synagogue, temple, or other place of worship.